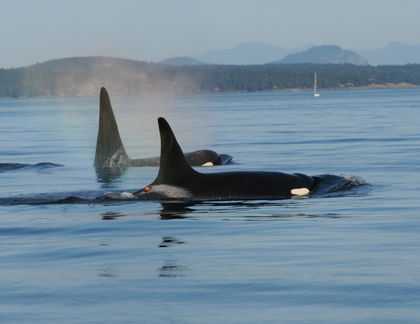 The authors measured noise levels at 12 sites in British Columbia, reporting that "In the frequency bands that killer whales use for social communication, noise levels were highest in legally designated killer whale critical habitats." Study sites ranged from Georgia Strait to Triple Island. Researchers found that anthropogenic noise could mask acoustic communication by up to 97% under extreme conditions, and may interfere with important survival behaviors ranging from navigation to finding food or selecting mates. Noise levels were found to be lower in baleen whale habitat. The authors recommend setting "limits of acceptable change in terms of population-level impacts, which can be modelled through effects from communication masking and/or disturbance on prey intake," or adjusting habitat designation based on ocean noise conditions.